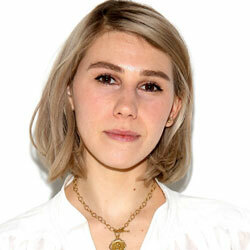 Zosia Mamet (born 2 February 1988 in Randolph, Vermont), is an American actress. She starred in the television shows Mad Men, United States of Tara, Parenthood, and the HBO series Girls. Mamet was cast for the Fall 2016 campaign for Kate Spade along with fellow actress Bernadette Peters and dancers Justin Peck and Xin Ying.